The new 9.0 release increases again the feature range for managed switches from the MACH, MICE, Rail and OCTOPUS families from Hirschmann. Layer 2 Basic: Suitable for RSB20, OCTOPUS.The cost-effective entrance into managed switch capabilities. Includes statistics, filters, and redundancy technologies. The alternative for unmanaged switches. Layer 2 Enhanced: Suitable for RS20/RS30/RS40, MS20/MS30.Basic level plus a wide range of management, filter and diagnostic functions. 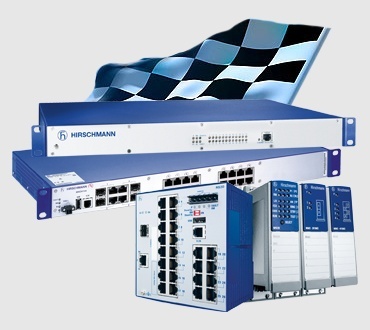 Fast redundancy mechanisms, industrial profiles like EtherNet/IP and PROFINET and security features are also supported. Ideally suited for standard industrial applications. Layer 2 Professional: Suitable for RS20/RS30/RS40, MS20/MS30, OCTOPUS, PowerMICE, RSR20/RSR30, MACH100, MACH1000, MACH4000.Enhanced software plus extended diagnostic, filter properties, security and redundancy features. A software package for applications where great value is placed on uncompromising plant safety and the highest level of availability. Layer 3 Enhanced: Suitable for PowerMICE, MACH4000.Professional L2 software plus additional security, static routing, router and link redundancy. The Layer 3 software for smaller networks and applications with extended security requirements. Layer 3 Professional: Suitable for PowerMICE, MACH104, MACH1040, MACH4000.Layer 3 Enhanced plus a wide range of dynamic routing protocols, fast router redundancy and enhanced link redundancy.